Item:Dassault-Breguet Super Etendard. This resin set includes the resin and photo etch parts shown in the photo. This set includes 5 Etendard fighters. Black Dog castings have established excellent reputation among modelers with their resin quality. They have repeatedly impressed modelers with their fine rendered parts which leads to the distinctiveness of final kit. 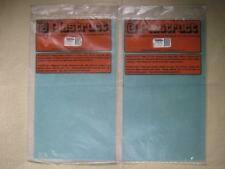 Model kit's box is sealed and kit is assumed to be bagged and complete. Item:U.S. Navy Subchaser. This kit is COMPLETE and MINT IN THE BOX, with ALL of the parts still sealed in bags inside the box! The Subchaser is 3-5/8" long. The box is in good condition. Eagle Strike Decals. Copper State Models. Alliance Model Works. Friul Model. Tiger Model Designs. Yahu Model. Master Model. Model Technologies. For Tamiya 78018. Eduard 1/350USS BB-63 Missouri. Item:Main Turrets with Gun Barrels for theYamato. 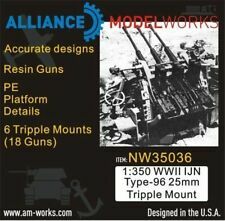 This resin set includes 1 Turret with Gun Barrels. Item:PBR 31 Mk.II "Pibber". The box is in good condition. This set includes the resin and photo etch parts shown in the photos. This set includes 1 Shore Ramp. Item:Mulberry Shore Ramp Set. Item:Main Turrets with Gun Barrels for theRichelieu. This resin set includes 2 Turrets with Gun Barrels. Type VII U-boats were the most common type of German World War II U-boat. The production of Type I was cut down only after two boats; the reasons for this are not certain and range from political decisions to faults of the type. 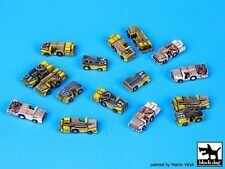 Item:Deck Tractors Accessories Resin Set. This set is NEW and MINT IN THE BOX! The box is in good condition. This set includes the pieces shown in the photos. Item:20mm Oerlikon Guns. This resin set includes 6 Guns. The set includes the resin and photo etch parts shown in the photos. Paragon Designs. 1:1 Scale Weapon Models. Alclad II Lacquers. Hobby Boss. Alliance Model Works. Super Scale Int. Reality In Scale. Friul Model. 1:1 Scale Weapon Models. Alliance Model Works. Montex Mask. Star Wars Collectibles. Hobby Craft. Cutting Edge. Star Decal - Bison. Failure to comply with this will result in unpaid item filing. Advent #2502 Campbeltown WW2 Destroyer- Partially build...see pics. Condition is Used. Shipped with USPS Priority Mail. Item:5"/38 Mk.28 Model 3 Enclosed Twin Gun Turret. This resin set includes 5 Turrets. Echelon Fine Decal. Super Scale Int. Failure to comply with this will result in unpaid item filing. Bob Smith Industries. Master Model. Mantis Miniatures. Live Resin. Yahu Model. Set of 4 turrets with 8 barrels. Discontinued when sold out. The scal of this set is 1/700. For the most part this set illustrates a gun crew and helmsman. Mr. Blackmore's work has been on display in various Civil War museums in the South. This resin set includes 4 Guns. The set includes the resin and photo etch parts shown in the photos. Item:3"/50 Gun on Open Mount. Class Catapult and Crane. This resin set includes 2 Catapults and 2 Cranes sets. The set includes the resin and photo etch parts shown in the photos. Dodo models 1/700 Kingston-class coastal defence vessel resin kit (Order before 6/30/2015 to receive a 1/700 Maus tank as gift!). The Kingston class consists of 12 coastal defence vessels operated by the Royal Canadian Navy. Paragon Designs. 1:1 Scale Weapon Models. Hobby Boss. Alliance Model Works. Super Scale Int. Reality In Scale. Tiger Model Designs. Yahu Model. Item:Sikorsky HSS-1/S-58. This set includes the resin and photo etch parts shown in the photos. This set includes 5 Sikorsky helicopters. Plastic Model Kit from Lindberg. 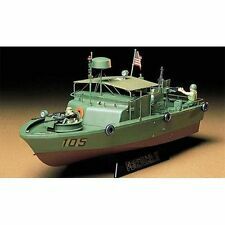 This is the 1/520 Scale US Navy Tanker Kennebec-Class. Length: 12 (304.8mm). Suitable for Ages 10 & Older. One plastic model. tlc 3/16/16. away from children 3 years of age and younger. 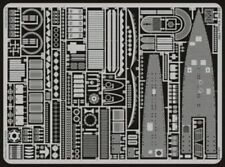 Aoshima's new tooling of their HMS Exeter Royal Navy heavy cruiser, in Her 1942 fit. Find also included in this Java Sea battle limited edition kit, Yamashita Hobby's 1/700 waterline model of the Imperial Japanese Navy Destroyer Inazuma in 1942. Surcouf was a French submarine ordered to be built in December 1927, launched on 18 October 1929, and commissioned in May 1934. 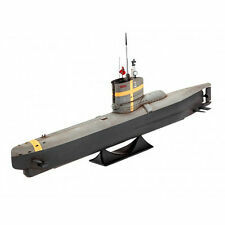 1/350 Scale Surcouf French Submarine: Length: 12.25". The cutaway section is limited to only one side of the model. The rings can be used on decks and superstructures, or masts and yardarms. Item:Rigging Rings. Replaces the 7 piece cannons from the Heller HMS Victory kit. While these are nice pieces, they are intended for below deck installations where having a barrel sticking out of hull doors is important. Revell #3017 USS Yorktown Aircraft Carrier kit. Sealed. 1/485 scale. Revell #3017 USS Yorktown Aircraft Carrier kit. Produced in 2011. This kit is COMPLETE and MINT IN THE BOX, with ALL of the parts still sealed in bags inside the box! The box is in good condition. The Russian Navy has 16 Akula class nuclear powered submarines. A number of Akula class submarines are deployed in the Pacific region. It is the quietest Russian nuclear submarine had ever built. HobbyBoss strives to continually improve and to make the best possible products. The model is still in the original plastic, there is a hole in it but not big enough for the parts to be taken out so I believe this is complete. Work was completed in February 1941, when she was commissioned into the German fleet. Each has details and features that even the most discriminating collectors will appreciate Textured surfaces that simulate wooden decks, intricate ironwork, chains and cleats.